Let me start by saying that my skin tends to be dry, and sensitive. 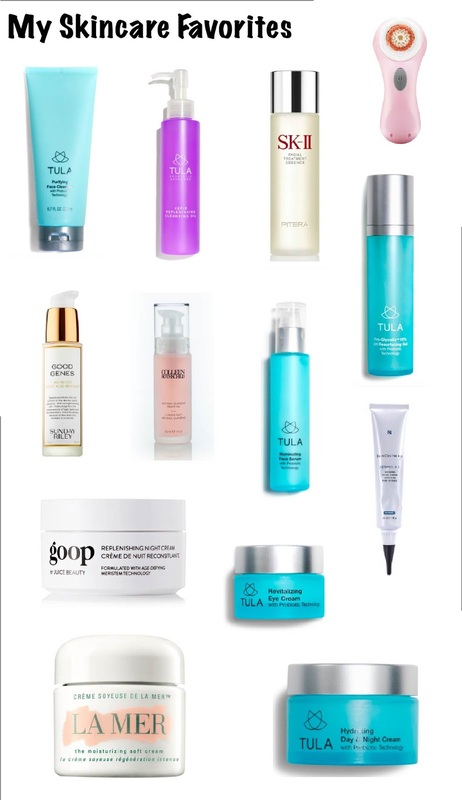 Before I was able to balance my skin with the help of Tula, I was pretty much bouncing around from product to product. Don't get me wrong, I still love trying new things, but I now have a set routine that I know will always work for me. Especially if I do try something and my skin reacts negatively, I know that in just a short amount of time it will all go away if I go back to my usual routine. Cleanse - I always cleanse twice. Once with my hands and then again with my clarisonic. If i'm wearing more eye makeup, or just more makeup in general that day I'll use micellar water before my first cleanse to get as much off as I can. This Tula purifying cleanser is the first wash that I've used that will clean everything off my face, leave it feeling clean, but not super dry and feeling like I've just stripped my natural oils right out of my skin. You know that feeling? I hate that! This is by far the best cleanser I've ever used. In the morning, I'll use my Tula Kefir cleansing oil which I feel is super light and gets all of my serums and night creams off. If I didn't do an intense routine the night before, then I won't wash my face the next morning. Which is crazy, because I used to never be able to do that. My skin would always be so dry the next morning that I absolutely needed to basically start over and apply oils and moisturizer in the morning regardless of what I used the night before. Now, my skin is balanced and does not require as much work. Tone - My absolute favorite I've ever used, surprise surprise is from you guessed it, Tula. The Pro-Glycolic Resurfacing Gel on a cotton pad is what I use before my serums. This toner is alcohol free, and uses probiotics and glycolic acid to balance your skins PH level. I really can't live without this. I noticed a huge difference in my skins hydration, and surface - it makes your face SO soft and smooth. I use this every morning and night. After my toner, I use SKII Facial Treatment Essence. This is basically miracle water. There isn't a scent, and its super lightweight. You won't feel it on your skin, but it does wonders. Brightens, hydrates, smooths, evens skin tone, and stimulates the skin's natural renewal process. Powerful anti aging and hydrating properties. I use this every morning and night. Tula Illuminating Serum - Love this lightweight serum that targets dark spots, hyper pigmentation, and dull skin. I use this morning and night, everyday. Colleen Rothschild Retinol Supreme Night Oil - This is such an amazing product because it doesn't dry out my skin like my retinol cream does! There are nine plant based oils in this to replenish moisture and prevent irritation and flaking from the retinol. I definitely wake up with radiant skin when I use this. Sunday Riley Good Genes - I tried this on the back of my hand in Sephora one day and was amazed. I can literally tell a difference in my skin the minute after I apply this. For me, this clarifies my skin, and smoothes fine lines while dramatically brightening and makes me glow like crazy. The dark spots on my cheeks are almost gone already from continued use! I use this on the nights that I do not use my retinol. About 3 nights a week. Skin Ceuticals Retinol Refining Night Cream - My favorite retinol cream that I've tried. I only use once a week. If I want to use less of my CR retinol supreme night oil, I'll use this 2 nights a week instead. I like to be extra careful and not use too much retinol in my routine. Elemis Peptide4 Night Recovery Cream-Oil- Love this so far! Recently started using this, and I like that it rebalances and restores your skin! Image Skincare Vital C Hydrating Anti Aging Serum - My absolute favorite Vitamin C serum. I immediately notice a difference in my skin when I do not use this. Plus, it smells delicious! Tula Hydrating Day & Night cream - First moisturizer to not break me out, and actually keep me hydrated without having to reapply multiple times. I use this every day. La Mer moisturizing soft cream - This is very rich for my skin, so I only use a few times a week. Whenever I want that extra hydration, or before my primer when I'm applying makeup. I love the way it makes my skin look radiant and glow. Goop Replenishing Night Cream - This cream is absolutely amazing. I remember the first night I tried it, and when I woke up my skin was super bright, hydrated, and plump. I'll use this every other night/ as needed throughout the week! Elemis Marine Collagen Cream - Recently tried this, and love it so far. Multi-Spectrum Eye Renewal Serum - I love the applicator for this, it feels really nice and cold. De-puffs my eyes, and makes my under eyes nice and smooth. I like to use this every morning, and a little bit before my eye cream at night. Tula revitalizing eye cream - This is rich, but not greasy and does not break my sensitive eye area out at all. I have had such a problem with finding an eye cream that will hydrate my skin, but everything else I've used has left me with small little bumps around the eye area. This cream has helped so much with my dark circles and keeping the area moisturized to prevent wrinkles. Elemis Pro-Collagen Advanced Eye Treatment- Love this so far, and can definitely tell it making a difference with my fine lines. The best spot control I've ever used, and cannot live without is from Evolue Skincare. The Clear Spot Control is amazing, and I use at the first sign of a blemish whether its under the skin or not, until the blemish disappears. I personally apply this onto my blemish every 3 hours during the day (give or take) and then once more before bed. I've had a huge blemish under the skin disappear in 2 days without ever turning into a scab or scar. There it is, my friends! My skincare routine finally revealed. I'll be sharing a post on my favorite face masks next. Let me know your thoughts or questions down below! Don't forget to use code LITTLEBLONDE for 20% off skincare from Tula, and LITTLEBLONDE15 for 15% off supplements.